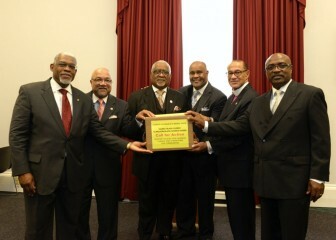 Leaders of the nation’s major Black churches, from left, the Rev. Dr. Earl D. Trent, Jr., the Rev. Dr. Timothy Tee Boddie, the Rev. Jesse V. Bottoms, Jr., the Rev. Brian K. Brown, Bishop Carroll A. Baltimore and Bishop James B. Walker presented over 10,000 pastors’ signatures to Congressional Black Caucus members in support of President Obama’s Clean Power Plan. The leaders said they are making the effort to push forward the bill, which has a goal to reduce carbon dioxide emissions by 32 percent by 2030. Bishop George Battle, senior bishop of A.M.E. Zion Church; the Rev. Samuel C. Tolbert, Jr., president of the National Baptist Convention of America, and the Rev. Timothy Tee Boddie, general secretary to the Progressive National Baptist Convention of America, were among the 10,000 who presented their signatures to members of the Congressional Black Caucus. Congresswoman Barbara Lee, who represents Oakland, Berkeley and other northern California cities applauded their effort. ” As faith and community leaders, their commitment to protecting and preserving our fragile planet is greatly needed as we work to address climate change,” Lee said in a statement. Lee said the president’s plan and other environmental action must have a positive effect on disadvantaged communities. “This is truly an issue about justice – environmental justice, economic justice and racial justice. The negative effects of pollution and climate change have disproportionately affected communities of color,” she said. According to caucus members, almost 40 percent of the six million Americans living close to coal-fired power plants are people of color, and they are disproportionately African-American. Pollutants released from those plants have led to high rates of asthma and respiratory issues within nearby communities. According to the president and his supporters, his plan would decrease premature deaths from emissions by nearly 90 percent and asthma attacks in children by 90,000 by 2030. The Rev. Jesse Bottoms, vice president of the National Baptist Convention, echoed concerns about the impact of pollutants on African Americans. According to the White House, the number of Americans with asthma has more than doubled over the last 30 years, and severe droughts, wildfires and the rising sea level are affecting communities nationwide. Of the 15 warmest years recorded, 14 of them have occurred since 2000, with the warmest year being 2014. Children and the elderly, the sick and the poor are most at risk from effects of climate change. Thanks to NNPA for sharing this story with us.